Non-irritating, natural solution for dogs and cats with allergies, itching, dryness and skin irritation. Also useful for pets with normal skin and promotes skin health. BotaniVet Manuka Honey Pet Shampoo is certified to USDA Organic food standards with 100% natural ingredients that you can trust. 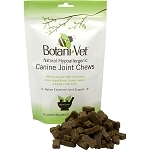 BotaniVet provides all natural, eco-friendly, certified organic, veterinarian formulated and recommended skin remedies. 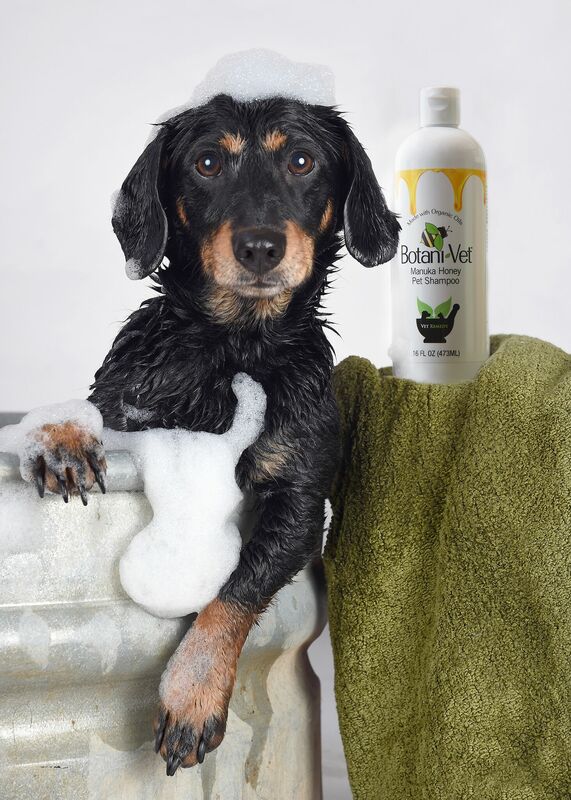 The soap in BotaniVet products is all natural and made from certified organic coconut, olive and jojoba oils. 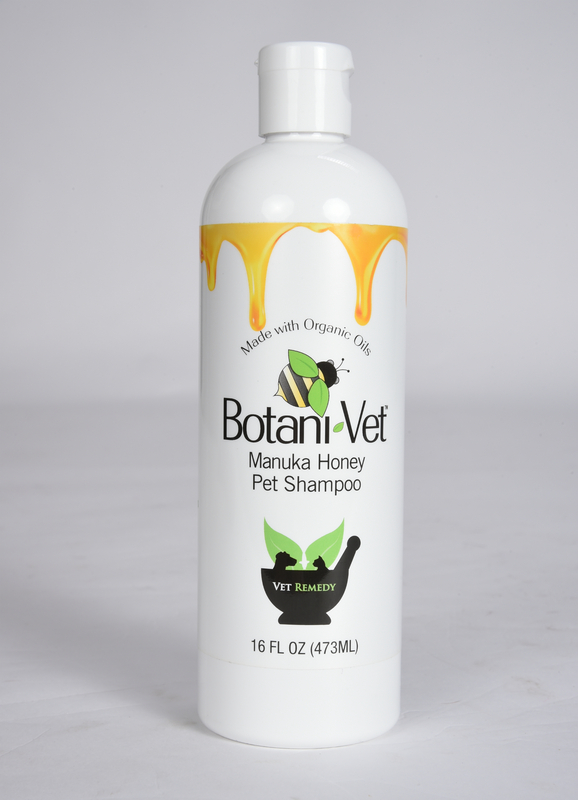 BotaniVet is the only topical product line made specifically for pets with powerful New Zealand Manuka honey. Organic, natural oils & pure Manuka honey are soothing and promote normal skin health. BotaniVet's powerful organic Manuka honey is made by hardworking bees in remote, pristine forests and mountains of New Zealand. Manuka honey has a variety of proposed health benefits including potent antibacterial and antifungal activity as well an aid in skin/wound healing. Every batch of BotaniVet Manuka honey is third party tested for its purity, biological activity and potency. Up to 20% of the dogs suffer from skin allergies. Pets with skin problems can be very sensitive to the harsh detergents and other chemicals including sulfates and preservatives used in almost all commercially available pet shampoos. 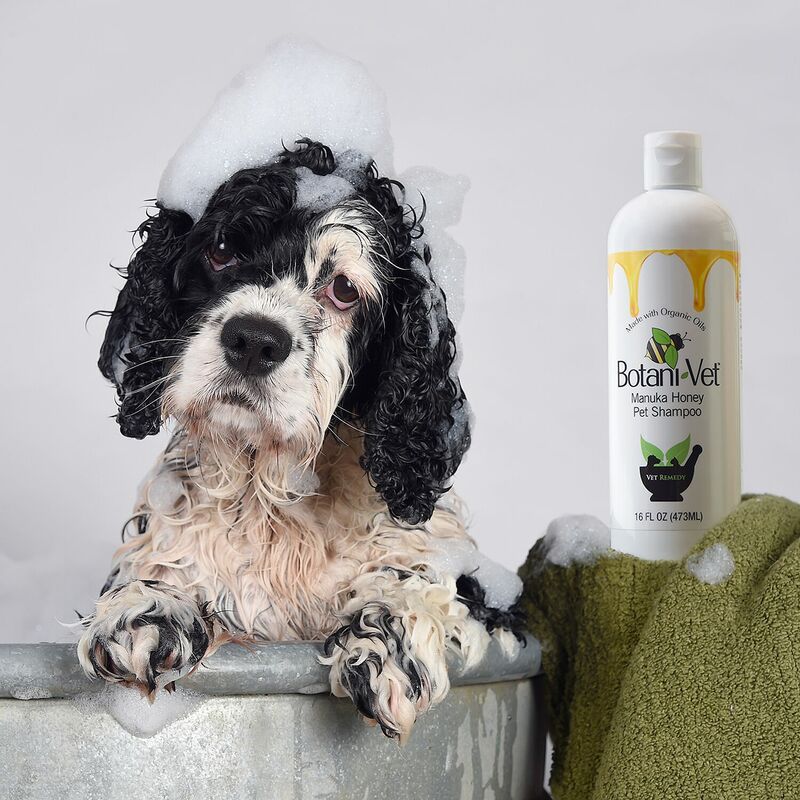 BotaniVet products offer all natural non-irritating solutions for your pet’s skin that are free of GMOs, sulfates, alcohols, harsh chemicals and detergents. Made in the USA. For topical/skin use in dogs and cats only. Avoid eye contact and ingestion. I have been using this shampoo on both of my allergic pugs as an alternative to the traditional medicated shampoos I normally use and prescribe to clients. Based on the ingredients, I was not surprised that it smelled great and lathered/cleaned them very well. What I was very pleasantly surprised by was that when one of my pups broke out in a pretty bad pyoderma (skin infection), 2-3 scrubs with the Botanivet shampoo cleared it up right away. I also really like that this line is free from overly strong and artificial scents and colors, as are all products for people with skin allergies. I plan on recommending this line of products to any client who is looking for more natural options, or whose pet has had a bad reaction to a traditional topical product! Wet fur and massage shampoo into coat until lathered. If possible, allow several minutes of contact time before rinsing thoroughly. Shampoo up to several times weekly or as directed by a veterinarian. Organic saponified coconut, olive and jojoba oils, manuka honey, organic vegetable glycerin, organic guar gum, natural berry fragrance, rosemarry extract (as natural preservative), organic aloe vera.